btn.Initialize(btn.A0, btn.MODE_INPUT_PULLUP) 'Using the internal pull up resistor to prevent the pin from floating. 'state will be False when the button is clicked because of the PULLUP mode. jinyistudio, pesquera, Kwame Twum and 5 others like this. Does the button object have built-in debouncing? There is no built-in debouncing. From my tests with physical buttons I didn't encounter any bouncing issues. That will only work if btn_StateChanged can only be called one at a time. Is that the case? Yes.. it worked and I could successfully turn on and off the led using the button. That solved the problem.. I am just wondering how come there's no ClearAll function.. to flush the memory with zeros. I suspect that you left somewhere a reference to Led 13. You should show us your code to see what exactly you have done. First ran Erel's example as is and it worked fine.. LED(pin13) responded to button press. Then I changed the pin number to 7 and connected it to external LED. It worked but pin 13 stayed on. I unplugged the power supply (USB) and plugged it back, but pin13 still on. From what I have experienced is that Led13 is ON by default. In the example above, this #13 pin is age-triggered, which means it fires it's function in the rising and falling ages, resulting in ON and OFF with one button press. Is there a way to ignore the falling age? pinButton.Initialize(pinButton.A5, pinButton.MODE_INPUT_PULLUP) 'Using the internal pull up resistor to prevent the pin from floating. If State = False Then    'remember, False means button pressed. Erel and Beja like this. Thank you Klaus for the perfect solution.. now working like a charm.. only the switching noise that some times results in more than a click (effect) but this is solved by adding a 0.1 μF disk ceramic capacitor. You should use Arduino IDE v1.6.11 or 1.6.13. Not 1.6.12. Don't try to hold the main thread in a loop. Events will not be raised. You should instead continue the program flow from the StateChanged event. 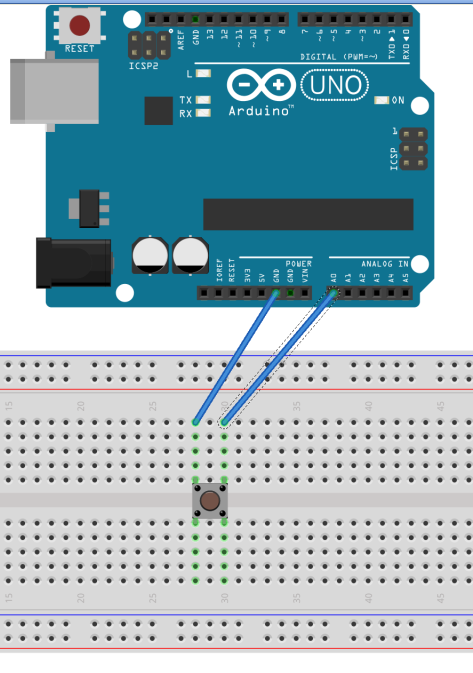 Actually Pin13 LED of Uno is Connected to +5V Supply....Just like pull up mode....Whenever Pin13 set as Output....by Default it set to low....So led glow whenever output is low...if you dont want to glow it....set pin 13 to high..